IR-MED develops a real-time, noninvasive optical monitoring for determining Propofol blood concentration. The system includes a set of sensors which are topically attached to the patient skin during anesthesia or sedation and a display. Propofol is the most commonly used drug for induction and maintenance of anesthesia and sedation. Real-time blood concentration of Propofol, if monitored on-line, will provide optimal drug performance and reduce side effects, morbidity and mortality associated with its current use. The off-line methods for Propofol measurements are laboratory based, time consuming, complicated, requiring blood sample for analysis, cost inefficient and are irrelevant in clinical real-time setting. As for now, there is no monitor of Propofol blood concentration. Such monitor could reduce procedural expenditures by enabling non-anesthesiologist physicians to administer propofol for procedural sedation. Otherwise, anesthesiologist involvement in short procedures (where Propofol could have been administered by non-anesthesiologist physicians if a real-time technology to monitor its blood level will be available) increases costs by up to US$ 1000 in the USA. 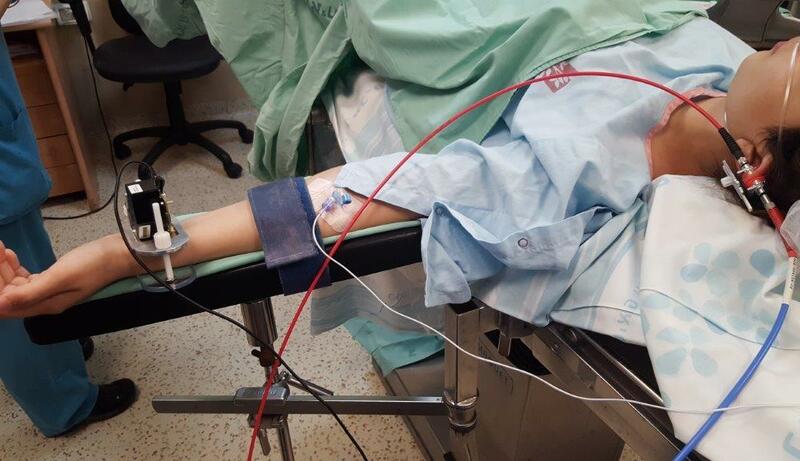 With the Israel Ministry of Health and IRB approval, first 40 women who underwent gynecological procedures under Propofol sedation completed the first human study in Rambam Health Care Campus in Israel with the IR-MED noninvasive real-time monitor of blood Propofol. The results demonstrate the ability to follow Propofol blood concentration changes noninvasively, in real-time and in a repeatable manner. The technology is protected by one patent in PCT stage and a second patent in submission.